A funny thing happens to me when I go to art museums. After a few hours of walking around and looking at the beautiful art—especially my favorites, the Dutch and Flemish masters and the French Impressionists—I find that other visitors to the gallery, ordinary people who normally wouldn’t draw my attention were we to pass one another on the street, become art themselves. It isn’t that the faces are transformed. They don’t become Manet or Picasso portraits—which is probably a good thing. But what happens is that, at least in my mind, they—just as they are—become paintings. They become art. The colors, the shading, the smiles or other features become more noticeable. The lighting lands just so, and suddenly it’s as though a frame appears around them, making this person or another stand out from all others. And more: Just as when we view a painting, we try to understand what the artist is trying to tell us, just so, when I see other visitors in the gallery in this way, I try to understand what they are thinking, what goes on in their minds at that moment. I find that it’s good training. We don’t often pay much attention to people we don’t know. And not only because half the time we’re looking at our screens, instead of what and who is around us. Plus, life goes by so fast: people walk fast, they drive fast; and with our full and busy schedules we don’t really have time to stop and pay attention. We pass each other by, not looking, not listening, not communicating. For me, going to a museum isn’t only about seeing the art—it’s about seeing my fellow human beings, discovering the beauty in them, beauty that’s often obscured by life’s worries and concerns. It’s like looking through a window, into their souls. It isn’t only the visual arts that have this effect on me. Music also throws open doors of communication for me—with the composer, with the performer, and often too, with the audience. A few evenings ago, I happened to run across a video of the theatrical show Stomp. In this exuberant performance, several characters find rhythm, expression and comedy in the most ordinary objects and moments in life. Whether it’s dragging a broom across the stage or banging on pots and pans, trash cans, kitchen sinks and other items you might find about you; as the performers interact, the rhythms and tones that emerge are complex and joyous. You can’t help but clap your hands or tap your foot in response. All of a sudden you realize that there is rhythm all around you; that sounds that you would normally block out can become wonderful music when you pay attention and listen to them. The effect lasts for quite some time, even after the show is over. Hours later, you still hear things differently. Sounds you never paid much attention to before stand out and proclaim themselves. A show like Stompmakes you listen to the music the world makes around you. You harmonize with it; your work—the tapping of your fingers on the keyboard—becomes a counterpoint to the hammer blows of the construction crew working on the house next door. The wail of an ambulance speeding by, a sound that alerts you, that cautions you to slow down, reminds you that Life has its own music, its own pulse, meter and rhythm. We are constantly surrounded by thousands of stimuli that tend to overwhelm us, and we respond by blocking them out. We put in earbuds; we wear noise-canceling headphones. We watch only shows that we know will entertain us, and which actually keep us from seeing the rest of life, all the random beauty that is everywhere, all around us, just waiting to be noticed. And the same is true for people. It isn’t until you find yourself isolated—by purpose or by accident—that you begin to pay attention to the people around you. It isn’t until the bubble that we surround ourselves with bursts, that we hear what they are saying to us. Until they scream or yell, we just don’t notice; we don’t hear. We have stopped communicating with one another. And that’s where Torah comes in. 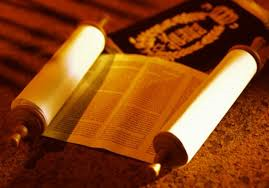 The Torah: It’s an ancient document that we honor and revere, but rarely take the time to actually study and think about. Its stories are fanciful and imaginative, but they rarely stand up to the tests of science and logic. Its primitive laws and rituals are antiquated, obsolete. So: Why Torah? Why study it? Why is Torah so important? Why immerse ourselves in trying to see the world as people did thousands of years ago? The reason is similar to why we go to museums or good concerts. It isn’t only to be entertained—though that’s important; and in truth some of the stories we read in the Torah are among the most magnificent literature that ever was told. But more than that, we study Torah because it sensitizes us, just like those other experiences. Art trains your eyes to see the beauty around you—in ordinary people and ordinary settings. Music trains your ear to listen and hear again. In the same way, Torah trains you; it helps you become the best you that you can be. We all know we have to “be good.” “Be good to your brother, your sister.” “Don’t hit.” “Don’t take that toy from your friend.” “Share.” We’ve heard these words so often that we’ve become inured to them. The danger is that by not thinking about what these words mean, we sometimes neglect them. We overlook opportunities to be good. We look for shortcuts, for the easiest way to get to where we’re going. Goodness becomes relative, dependent on the situation. We begin judging our behavior by a formula: How good do I have to be, to get what I want. The Torah reminds us that Goodness isn’t relative. Rather, it’s a finite yardstick by which we measure life, other people and ourselves. The Torah teaches us that by being good, by doing good, we can actually make the world around us a better place. The Torah would have us learn to see and hear each other as God would see and hear us—children, one and all, of one God. Transformed by this teaching, we can start seeing the beauty and goodness in others, regardless of how they’re dressed, what race or gender they are, regardless of whether they are among the popular kids or the nerds we’ve learned to laugh at or ignore. To elevate the ordinary into the extraordinary—that is the goal of the Torah’s teaching. To take our first impression and go beyond it, see behind the mask, perceive the image of God that is embedded in every human being, in every living creature. And that is why we study Torah. To be the best we can be. May we all learn to see the beauty in life, the miracles that present themselves daily to our weary eyes and ears. May all our words and deeds be filled with goodness, so that peace, goodness and harmony be the result of all that we do, tonight and every day of our lives. Next post: Holiday Greetings from Rabbi Boaz!